Today, Saturday, July 30 is National Cheesecake Day, and The Cheesecake Factory is celebrating with the introduction of a brand new cheesecake flavor and a special offer for dine-in guests. Guests can enjoy “Any Slice, Half Price” on Saturday, July 30, and choose from more than 30 flavors, or try the new Hershey’s Chocolate Bar Cheesecake, featuring Hershey’s Chocolate Cheesecake between layers of moist chocolate cake and ganache, finished with creamy chocolate frosting and chocolate chips. Random contest idea! Sing your Version of the Sasaki Food Time song! I know I have some very talented friends out there who love to sing! Here is your chance to sing your version of the Sasaki Food Time song! Take Emily's lyrics or make your own! I just ask that it stays family friendly! Send the mp3 my way and I'll post all of them and then let you decide on a winner! A Sasaki Food time tshirt goes out to the singer that wins! So remix the current song - sing a variation on the current song or write your own brand new lyrics! Create a video if you want and post it on YouTube! Good luck and remember - it's all about dining the Sasaki way! Contest begins today until the end of August! - on Carl’s Jr. Facebook page says they’re offering Famous Star burgers for 70 cents today, in honor of the 70th anniversary of the first Carl’s Jr. Check out Emily Simonian's new song on her website! Emily Simonian, the voice of the Official Sasaki Food Time theme song, has a new song "Carry You Home". It is now available on her website as a free mp3 download! What are you waiting for? Go get it! 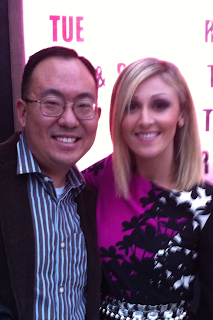 Just click on the link below and tell her that Jason from Sasaki Food Time sent you! The latest trend seems to be making downtown areas food meccas. Take places like downtown Fullerton and of course the Orange Circle as prime examples. Soon downtown Anaheim will have that distinction as well. 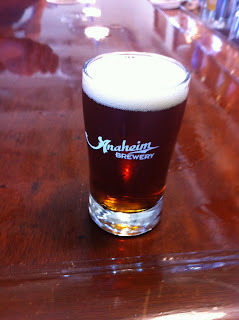 The beginnings of that opened the first of the month, Anaheim Brewery. If the place looks like it is still under construction - it is! 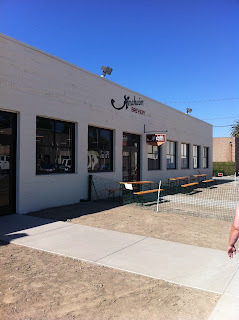 It is also the first part of a new food mecca for the downtown area. 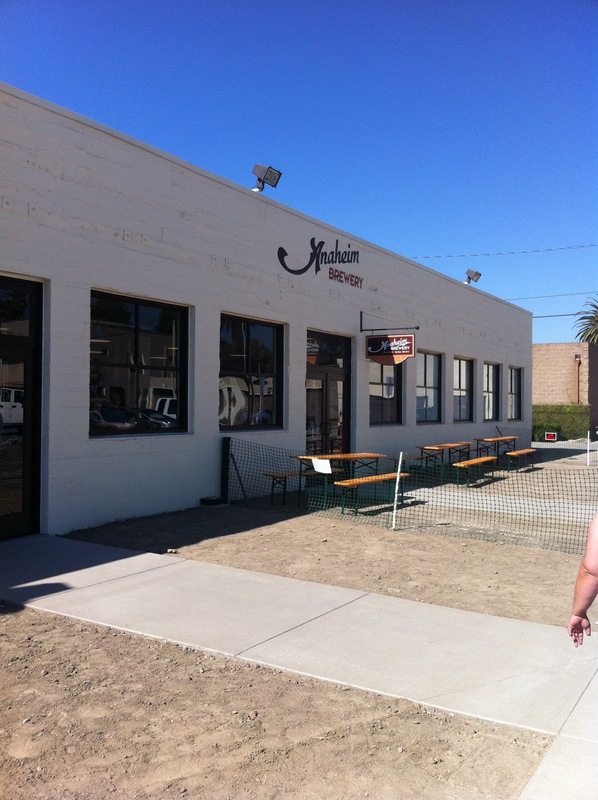 In December, Umami burger, one of the top rated burger places in the area will open it's first OC location Anaheim Brewery. Then sometime next year, the folks that operate The Camp in Costa Mesa will open the warehouse next door with roughly 20 food and beverage locations. There will also be a place for live music and local artists. Outside there will be places for food trucks and plans for a large outdoor movie screen to watch movies. 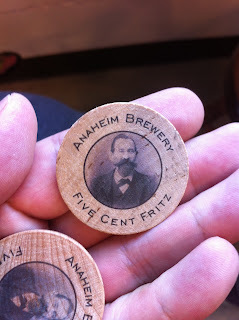 But let's get back to Anaheim Brewery. 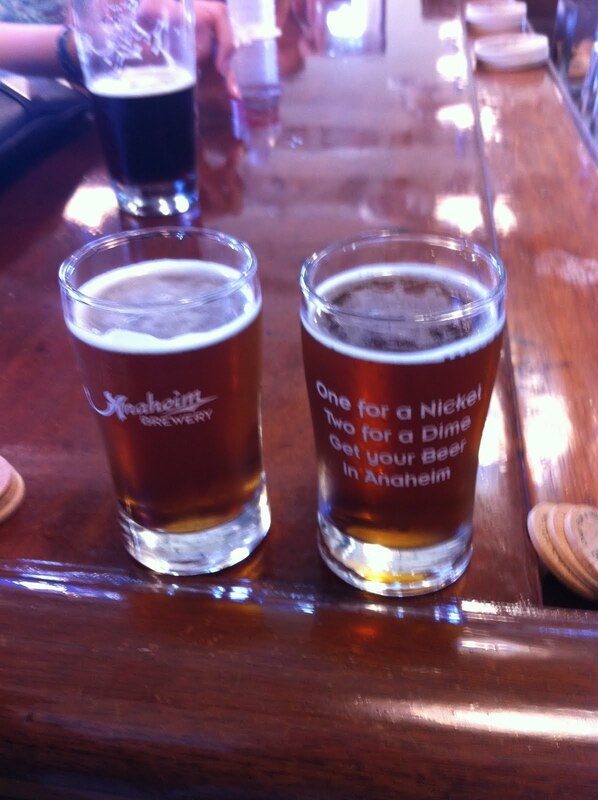 The Tasting Room is only open Friday - Sunday since they are actually bottling and packagng the rest of the week. Flights off all four beers are $8 with pints at $5. They also have growlers for you to take home and it's $20 with $15 refills. My friend Anthony and I went to try the first Anaheim Beer since prohibition! We each ordered a flight. The first beer was the Anaheim Gold. I'm typically not a fan of light beers, but this one definitely was well-balanced with a sweet finish. I would definitely come back for another one. If you're not able to get a seat at the bar, they will give you these wooden nickels to exchange one and your glass for a new beer along your flight. 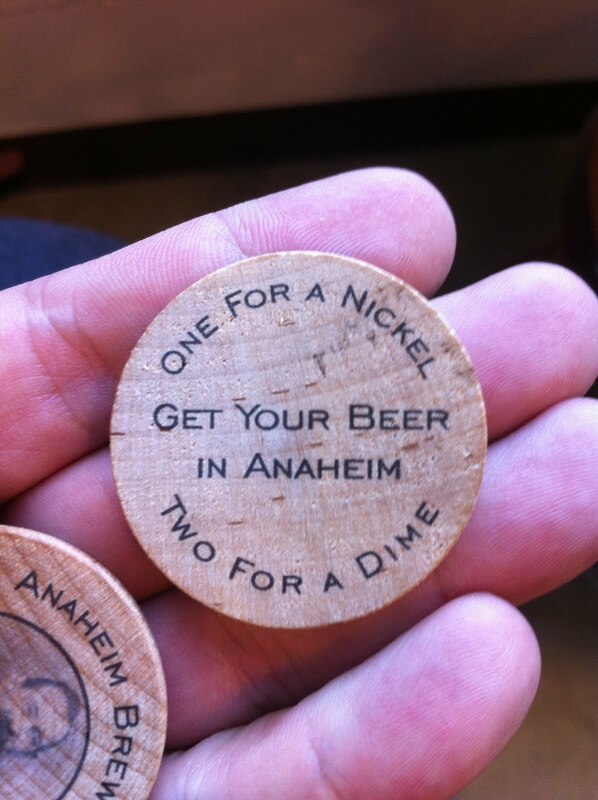 Hmmm seems like they should change it to Beer Time in Anaheim! 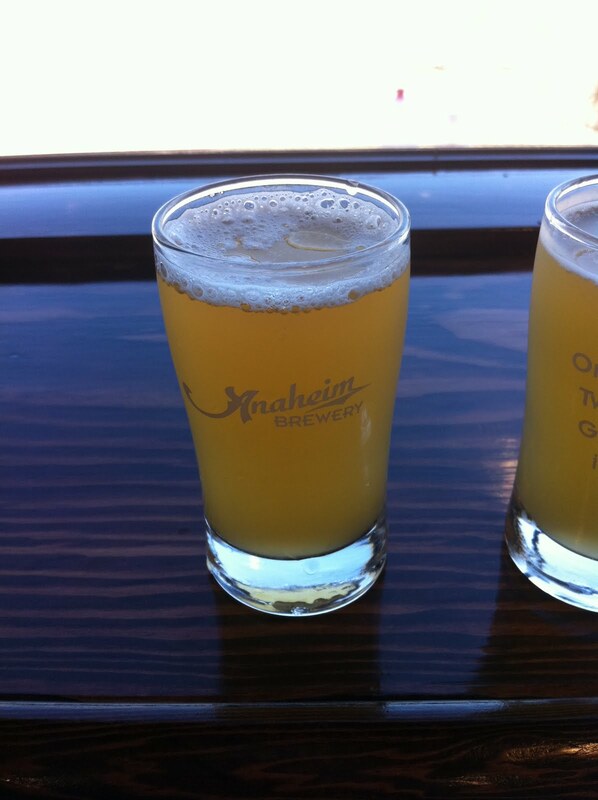 Next up was the Anaheim Hefeweizen. Once again I admit I am not a fan of Hef, but this had a smooth banana finish and would be another beer I would get again. 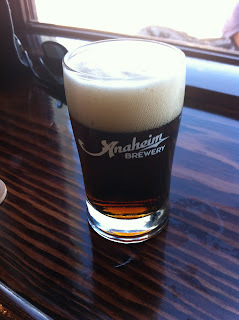 Our third beer was the Anaheim Red.Reds were one of my favorites and this one reminded me why it was one of my favorites. Great full bodied taste with a nice sharp bite at the end. I'll be coming back for more of the Anaheim Red time and time again! Last but not least was the Anaheim 1888. Let me tel you that 1888 must have been a really great year because this was my favorite of all four beers! Rich, smooth and full-bodied, I came back to get a growler a day later! The weekend tasting room hours: Friday 4 to 9 p.m.; Saturday 11 a.m. to 9 p.m. and Sunday 11 a.m. to 6 p.m.
A bit of Napa Valley in Stanton? In Stanton? That's right, in Stanton! Il Garage, the brainchild of Chef David Slay, is a must! Right next to his Park Ave restaurant known for its steaks, Il Garage is a pop-up restaurant that is only open for dinner and serves simple Italian fare. A simple sign lets you know you are almost there. 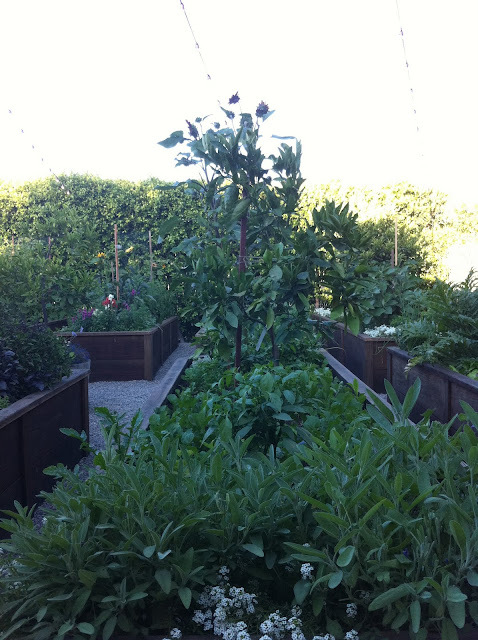 The menu changes daily and many of the ingredients come from his garden right on the property. 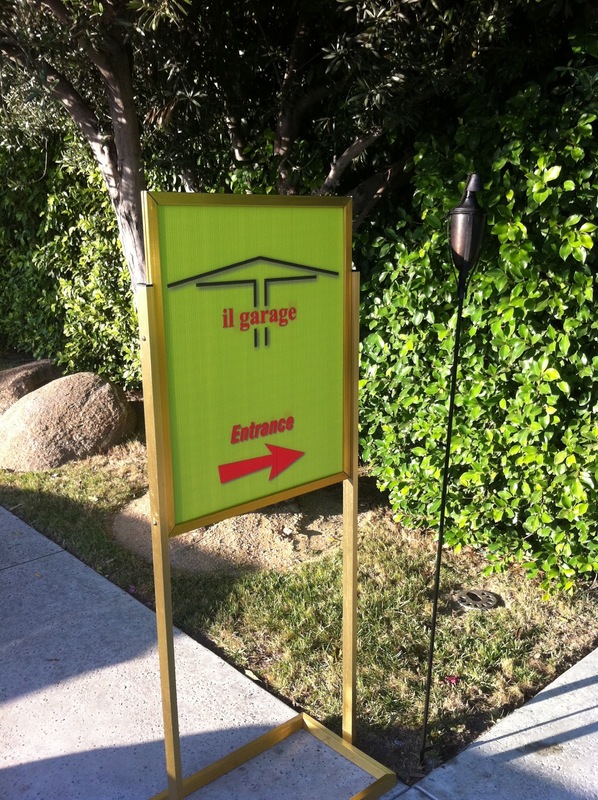 As a pop-up restaurant, Il Garage is open Tuesday through Saturday from 5pm-9pm. As the name suggests, Il Garage was once the garage on property.. 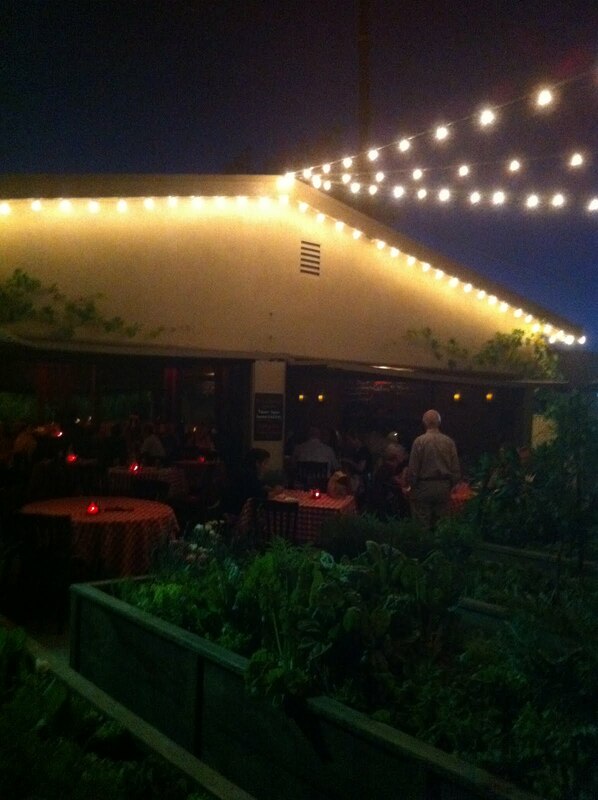 The open air restaurant feels like a bit of Napa Valley in the OC. Trust me when I tell you that you will find it hard to believe that Beach Blvd. is only a few feet away. 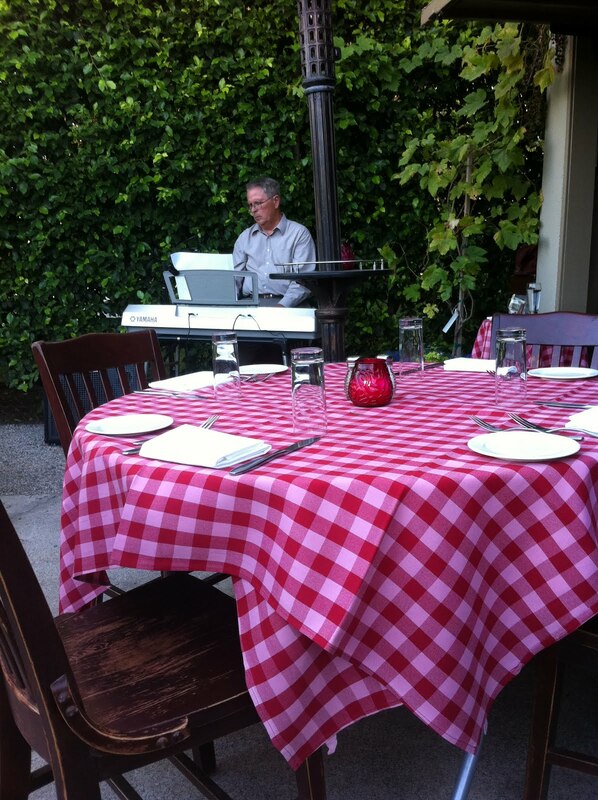 The restaurant is quiet and live music plays every night. This night we listened to classic jazz on keyboard. 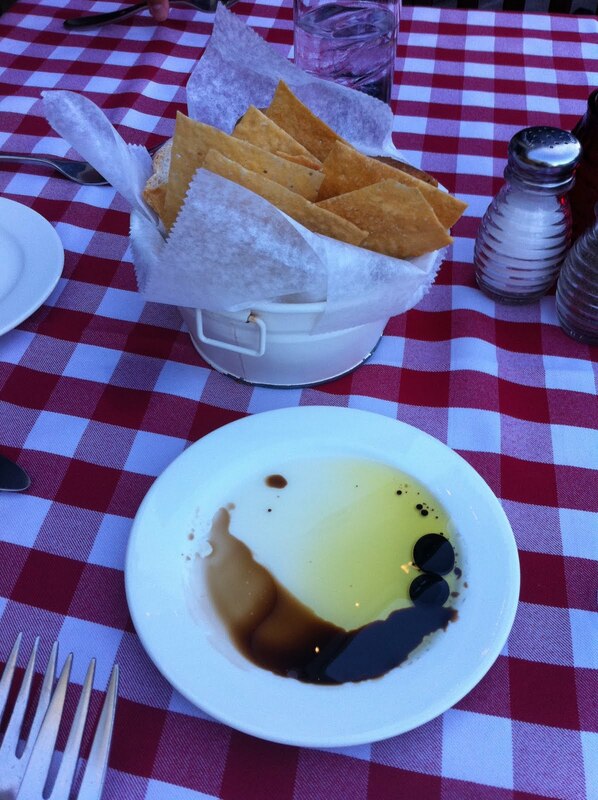 The meal begins with a lovely bread basket with some Parmesan crackers, rosemary rolls and crostini brushed with olive oil and vinegar. The service is outstanding. 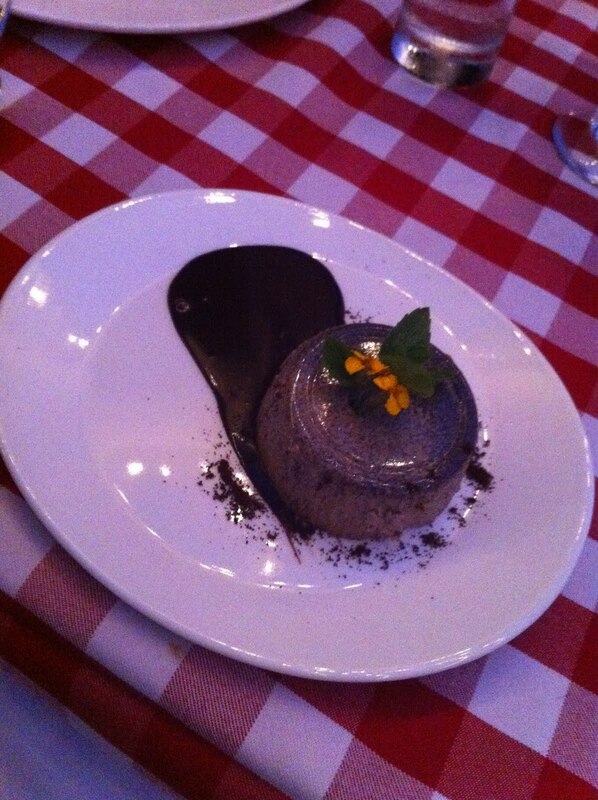 Our waitress Denise was warm and extremely knowledgeable about the menu and helped my friend with her selections. If the food was mediocre, it would be worth it to return to such wonderful service. But have no fear, the food was incredible, as were the drinks. 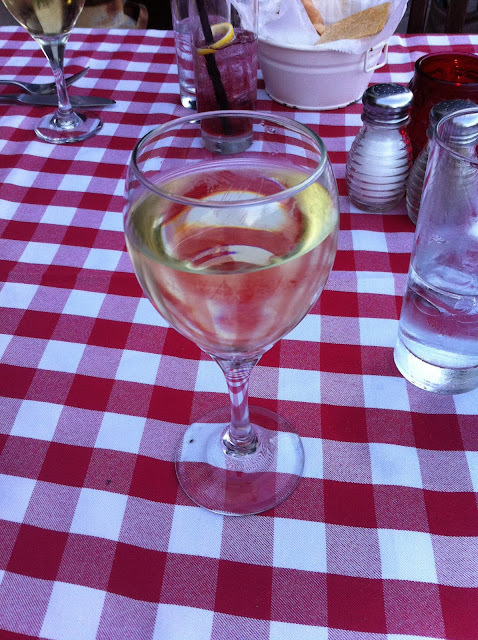 We both started off with a tiziano, chilled grape juice and prosecco. 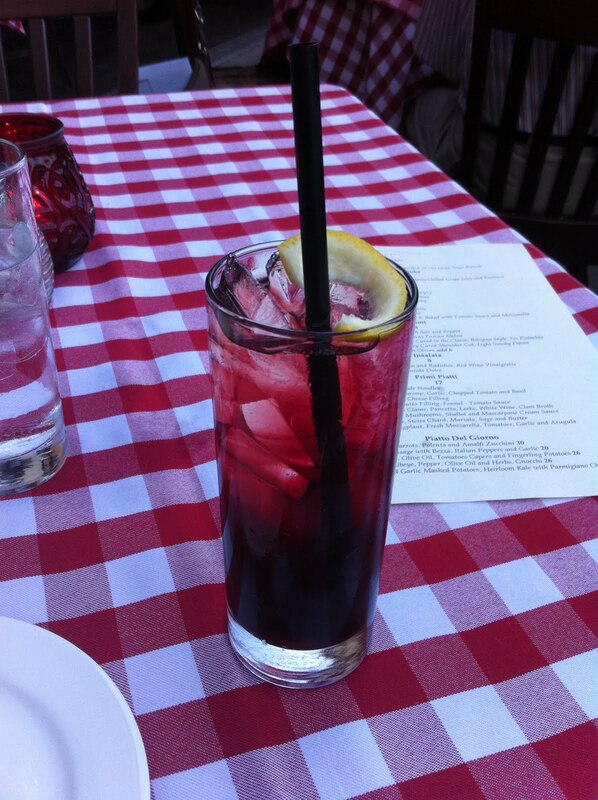 Just a cool refreshing drink that got us ready to start going through the menu. After debating what to start off with, we consulted with Denise, and decided to start with the fried green tomatoes parmigiano, baked with tomato sauce and mozzarella. 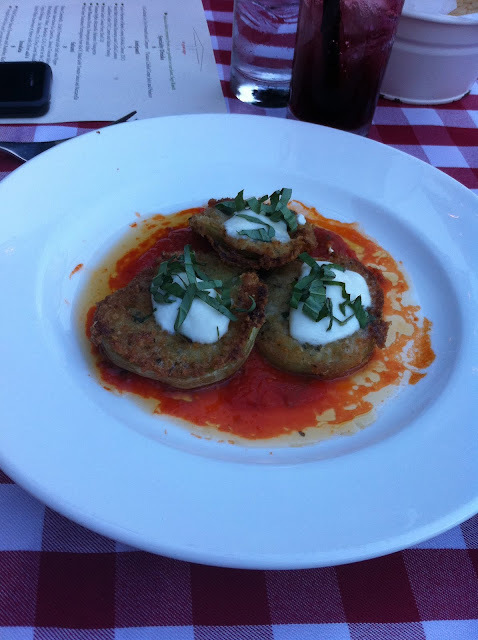 The batter was light and the tomato sauce with the green tomatoes were perfect as can be. There is something about knowing that your tomatoes were picked just steps away from your table that just adds to the flavor and enjoyment of the meal. 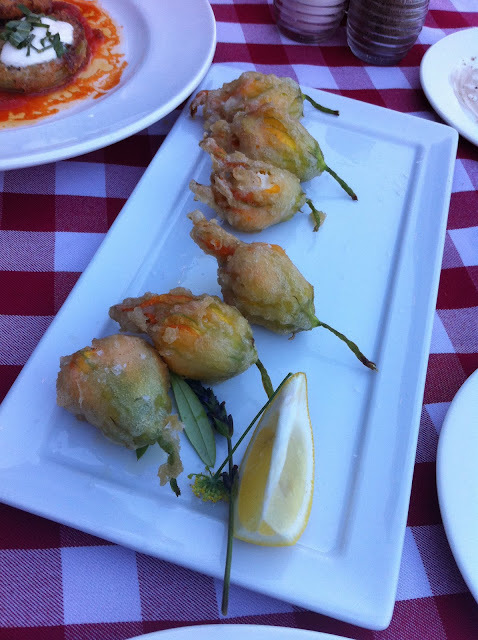 We also got the squash blossoms, filled with ricotta, parmigiano and mint. The hint of mint was perfect with the ricotta and a nice unexpected pairing of flavors. After our appetizers, we both went for a glass of Pinot Noir as we awaited our main course. 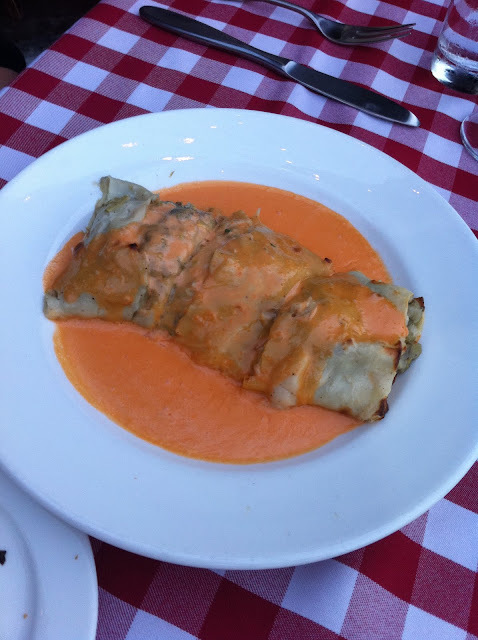 My friend went with the cannelloni which had an artichoke and goat cheese filling. The pasta was nice and light and the filling was perfectly blended, you would never know you were eating healthy. Il Garage makes all of its pasta fresh every single day. 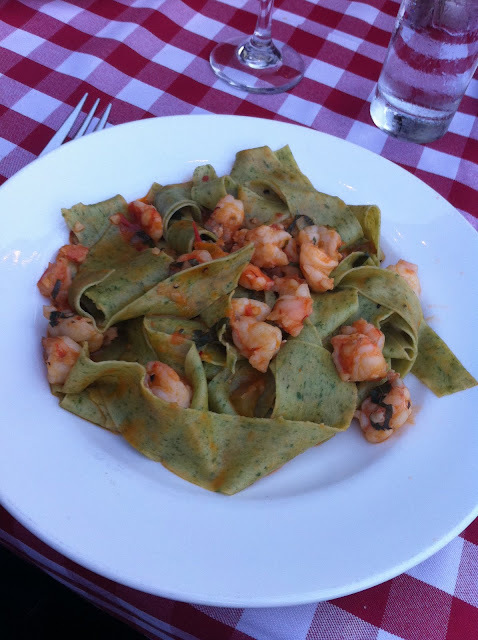 I decided on the spinachi tagliatelle which was tossed with chopped shrimp, garlic, tomatoes and basil. Once again the pasta was amazing. That combined with the fresh shrimp and fresh vegetables made for a wonderful taste sensation. We somehow managed to save room for dessert. 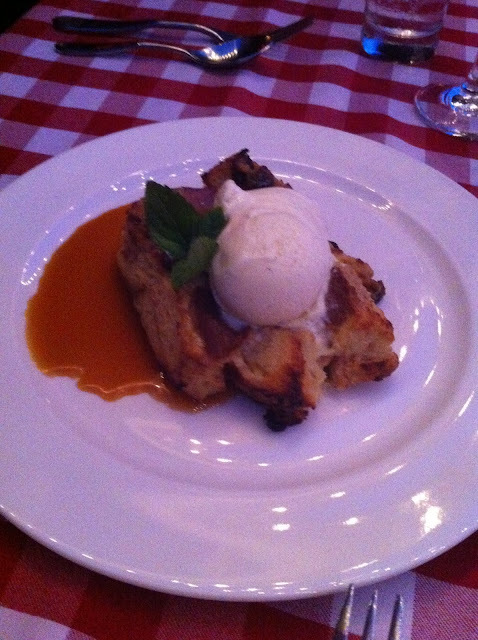 My friend decided on the rum raisin bread pudding made fresh that day. It was warm and rich and you could taste the rum. I went with an espresso and I failed by not knowing what it was called, but it was rich and creamy with espresso grounds mixed in and dark chocolate to taste. It was a perfect combination of flavors. A fantastic meal with incredible service makes Il Garage a place where I will come back to time and time again. This is a perfect first date place, or a wonderful place to go with a group of friends to enjoy a wonderfully prepared meal.